This dig started off for me about 8:00 on a Friday evening. I received a call from George and Ryan. They said they had got permission on a construction site in the center of Wilmington and were digging a very deep brickliner in the basement of a building that was being renovated. Ryan told me they were down about 19 feet and hade been finding some 18th century slipware pieces in the heavy sandy clay fill. They asked me if I would come help them dig and to bring my tripod because they said the hole took the entire 5-foot probe so they had no idea how deep this thing was going to be. I had already spent most of the day digging in Baltimore when I got their call. So I was already fairly tired but told them I would drive up and help. I arrived just before 10:00 that night and found George and Ryan taking a break, warming up in George’s van. Did I mention it was in the mid 20s that night? Well after asking them what was going on I said let me take a look at this thing. We proceeded in to the basement of the building and they showed me the huge pile of dirt they had and a very deep bricklined hole. I took one look at the placement of the pit and said why are you guys digging a well. I said its double course brick and its up very close to the street. Not where the privy lines should be in this block. They said but it has early shards in the fill I said well if it was abandoned early it could be good. But could easily be 30+ feet deep. Then I noticed a small 1880s ink bottle sitting next to the small pile of very early slipware shard and said where did you find the ink they said at about 15 feet in the well. I said well that tells you when it was abandoned about 1885 when Wilmington got city water and that they must have got old fill with some early artifacts in it to fill in the well. I suggested that they give up on this well and fill it in. I said are there any other pits on this site to dig. George said yes and showed me a couple very large pits that already had footers pored in them I said lets not disturb these and then he showed me one that was collapsing into another part of the basement floor. This one looked ok to dig so I grabbed Ryan to help open this one up while George filled in the well. I was about 11:00 by time we started this pit. It was a typical 4-foot diameter brickliner it was also partly under a building footer. But had a large stone support for the building foundation to rest on. This was typically done in the late 19th century when larger buildings such as this one were built to the property lines covering up the earlier privies. 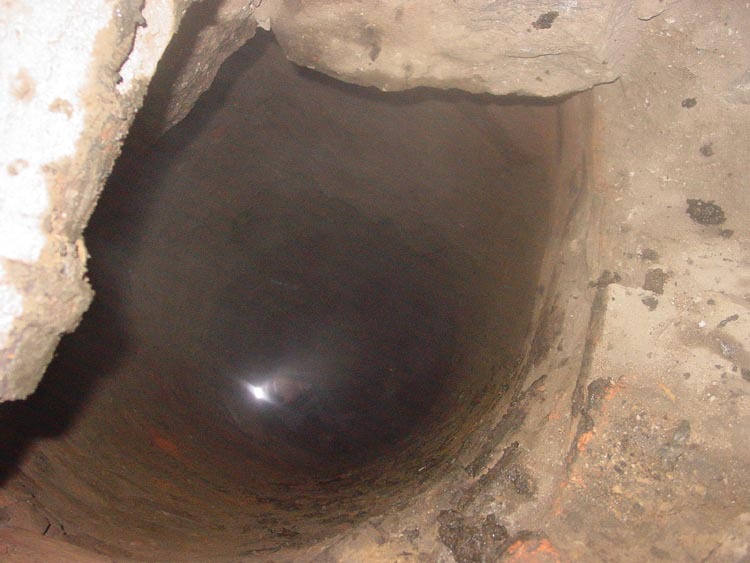 We popped up the concrete floor over it and revealed about a 3-foot air void where this pit had been sinking. The first couple feet of soil were mostly 100 years of dust and rat nest and some circa 1880-1900 era brick rubble. After getting through this the fill changed to heavy sandy clay. However mixed with the clay was a few early black glass bases and a few shards of creamware and early slipware. I told Ryan that this was going to be a very early pit and most likely if there was a trash layer it would be 18th centaury. I also expressed that if this pit had a very large trash layer I wanted to do it properly and save everything. Not just stir up the context and look for bottles because that’s a very stupid thing to do on these early pits as you don’t get the chance to dig a lot of them. And most contain very few intact finds. After continuing down through the sandy clay fill for about 8 feet we hit a layer change. This was a small layer of a gray loamy clay that was mixed with some artifacts these were all pre 1790 and most were of the types of wares found typically during the revolutionary war era of the mid 1770s to the mid 1780s. I did a test hole down about another foot into this layer and reviled the start of the black layer and that the pit was going to be wet and we would have to bail it the rest of the way. I asked George who was now pulling buckets for me, what time is it? He expressed its late then said it almost 3:00 am. I said I’m pretty beat and George and Ryan expressed the same. So I suggested we Fill the pit back in and return the following weekend and redig the pit back out and do a proper job of excavating the trash layer. 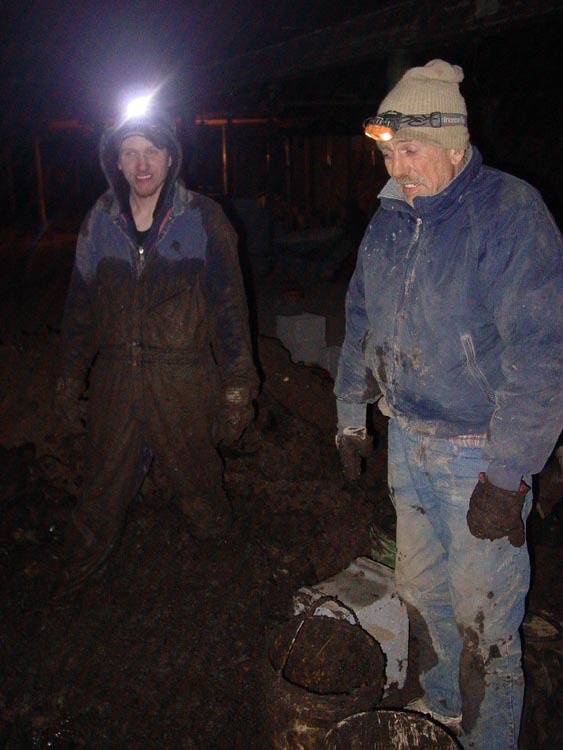 It was agreed and I climbed out of the now 13 foot deep pit and helped fill all the dirt back in. I had one bucket of artifacts mostly ceramics and a few bottle pieces from my test hole into the trash layer. These artifacts included pieces of highly decorated slipware some plain black glazed redware and of some Creamware. I was very excited about this privy because I’ve only had the chance to dig a dozen or so true 18th century context privies and this one had a big trash layer as I probed the layer from my test hole revealing about 4 feet of black layer. After all was said and done we leaded up all our tools and headed home I finally made it home about 5:30am and after a shower went straight to bed. Over the next week excitement continued to build over our upcoming dig. It was agreed that we could used a 4th person on this dig so we invited Doug to help with the sifting and sorting of the artifacts as they layer was coming out of the pit. Finally the day arrived we planned to dig the following Sunday Doug, Ryan, and myself all arrived about the same time and loaded our equipment into the site and quickly started opening up the pit. George was running about an hour late It was pretty easy digging sense the fill in the pit was already soft from us previously digging it out. So we quickly got back to the trash layer in about 3 hours. This time Ryan totally uncovered the small loamy gray clay layer. This small layer was only about 12 inches thick and was slightly thinner on the south west side of the privy. Just under this layer we hit water and a drastic color change. This is where the thick black organic muck started. Once down to the water Ryan let me get into the pit and deal with the Black layer. This layer was very laden with artifacts for the first foot and a half, very few pieces of bottles but there were quite a few broken engraved clear flint flip glasses and several Georgian style wine goblets. 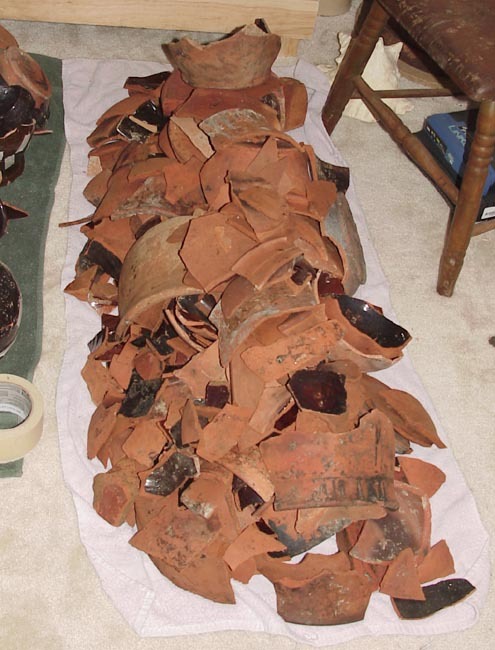 Most of the artifacts in this layer were of locally produced slipware, coarse redware, English Creamware, English Mocha Ware, some Chinese export porcelain, a few shards of English white saltglaze, and a few shard of English Brown saltglaze. The age of most artifacts in this layer was 1770s-1780s with the very early agate mocha ware tankard being the latest piece in this layer probably dating mid 1780s. This layer soon gave way to a fairly sterile layer that contained very few artifacts only a few pieces of mostly corse earthen ware were recovered in this layer and a small amount of English white saltglaze. This layer was a thick black organic material with a high concentration of lime mixed in with it. Strong evidence of a clean out having been done just before the revolution broke out in the early to mid 1770s. After proceeding through this sterile layer I encountered another layer again very heavily laden with artifacts. 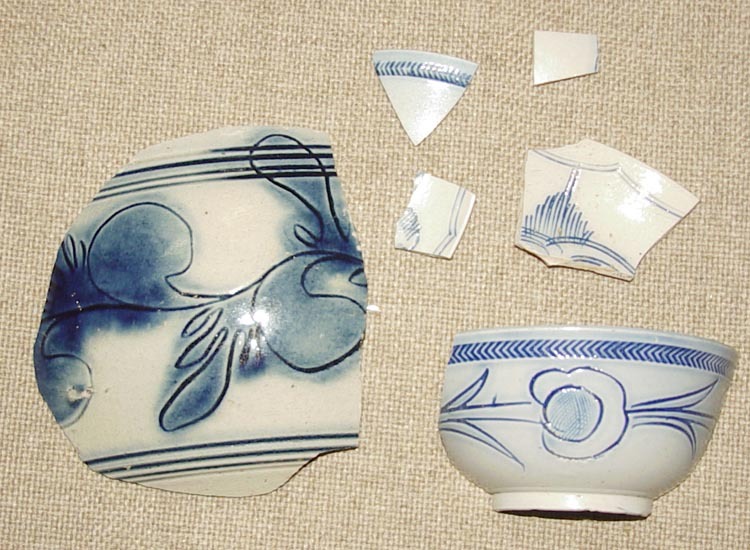 The artifacts had dropped slightly in age as I was finding much less Creamware and far more English white saltglaze. 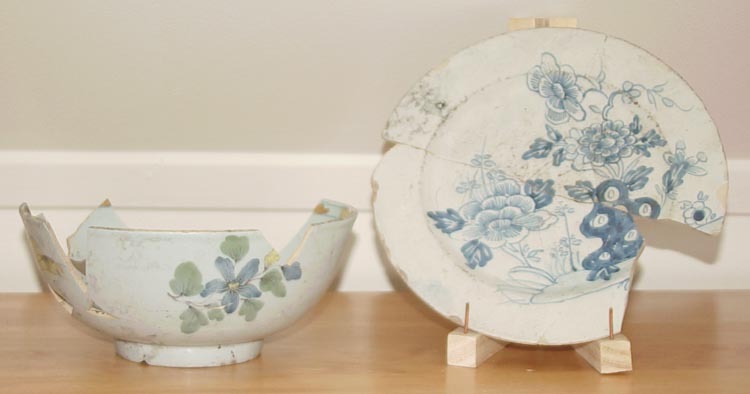 Some more Chinese Export Porcelain, Tin glazed earthenware (Delft), a few shards of Westerwald saltglaze stoneware, and a single shard of English Agate Ware showed up. This layer also contained many bottles that were almost completely intact. 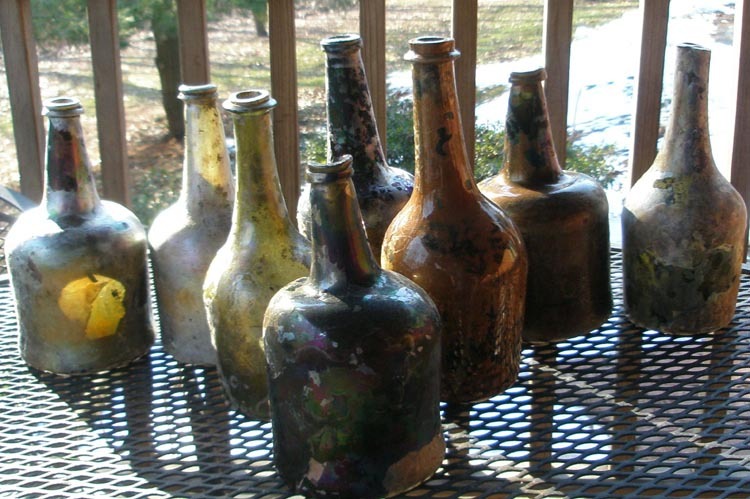 These bottles were of both English and continental manufacture and of the style commonly associated with the 1745-1765 era. Of the ceramics recovered from this layer only a small amount was of the locally produced Slipwares most of the pieces we from 3 combed slipware plates. Much of the rest of the locally produced wares were of the corse redware that is typically unglazed except on the inside of the vessel to make it water tight. These vessels included many small ovoid jars and a few vessels that were overall black glazed including several chamber pots a small cup and a large tankard. This final layer was about 1.5 feet thick and the very bottom of the hole was almost completely covered with bottles of the Black Glass Mallet type. The bottom of the pit was hard natural gray clay with round river stones mixed in it. This privy was approximately 18 feet deep. And had a context of 1750s-1780s being filled in between 1785-1790. 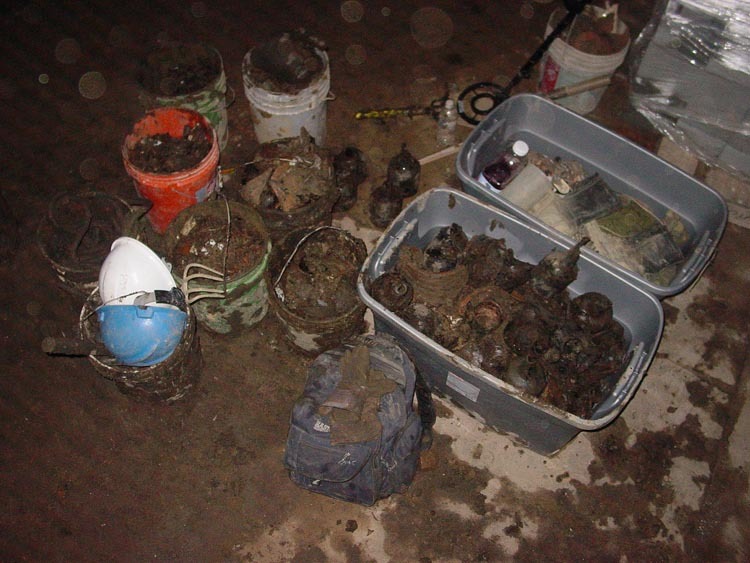 Approximately 14 five gallon buckets of artifacts were recovered from this privy. 10 of those were ceramics and the other 4 were of glass and bottles. Of the glass recovered most was English with some being continental and a very small amount possibly being American. Of the English produced glass most was the typical Sand pontiled black glass mallet of about a quart size. With parts to one large storage carboy of approximately 3-5 gallons, one small octagonal wide mouth utility possibly a snuff jar. And several each pattern and dip molded and engraved Flip glasses and Georgian wine goblets. The continental produced glass was mostly Case bottles of about 10 inches in height with one very large example with a height probably more then 15 inches. And several open pontiled mallet type forms that tapered slightly to the bottom. And one small greenish aqua serving bottle with a conical kick up and open pontil. The bottles that were most likely American were of the typical chestnut form flask and one small bluish aqua case bottle. Of the multitude of ceramic types and vessels found in this privy. The most common was locally produced coarse redware Much of this was only glazed on its interior to make it water proof. Other was glazed with an overall black glaze and some was decorated with colorful slips. The forms represented in this group were Jars, cups, tankards, chamber pots, jugs, pans, bowls, and plates. The second most common group of ceramics was English Creamware Represented in this group were plates, cups, bowls, saucers, and teapots. The third most abundant type of ceramic was Chinese Export porcelain. This group contained large bowls, small handless tea bowls, and plates. Of the less common ceramic types that made up the balance of artifacts were English white saltglaze stoneware, tin glazed earthenware (delft), scratch blue, English Agate Ware, and some Westerwald blue decorated stoneware. All of these ceramic types and the reconstructed vessel forms will be discussed further below. Of the plain interior glazed ware small ovoid jars of about 1 gallon made up most of the group with a few milk pans also. I have yet to reconstruct any of the interior glazed redware. Of the 5 vessels included in this picture are from left to right a quart sized tankard, a small cup, an ovoid jar, an ovoid jug, and a chamber pot. Making an attribution to a particular potter with these plain utilitarian wares is very difficult. Most redware potters of this time would most likely have been making all of these forms as a staple of their business. However these wares tend not to travel too far from where they were made. Simply because any town with its own local potter would not have a need to import such simple everyday pieces. 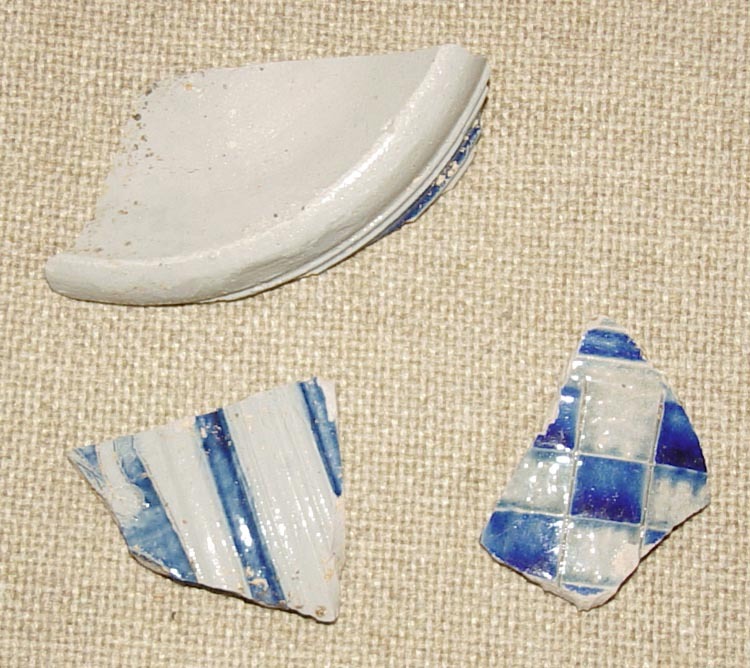 Its of my opinion that the Chamber pot, jug, cup, and jar are very likely locally made as they were found in the upper part of the trash layer dating them to between 1770-1785 where as the Tankard was found in the lower part of the trash layer Dating it to between 1750s-1760s It exhibits a far different glaze and foot then the other pieces so I believe this piece was most likely made in Philadelphia or perhaps New Jersey. The pieces that were locally made are posably made by Mathew Crips. In 1760 he bought the land east of King Street, between Seventh and Eighth Streets, and on it started the first pottery in Wilmington. He sold the products of his manufacture in Delaware and New Jersey, until he grew wealthy. In 1797 he built a large mansion on this square, in which he lived for several years before his death. Of the 8 vessels pictured all are heavily slip decorated in the English tradition that was very popular in most colonial east cost cities. These vessels include from left to right. A combed plate, a bowl, another combed plate, a small pan, another combed plate, a chamber pot, a bowl, and a large pan. Most of the Slipware was recovered from the upper part of the trash layer with the exception being the three combed slipware plates these were fund just under the sterile in the top of the lower artifact layer. The pans bowls and chamber pot can be dated to circa 1770-1785. The two pans are very typical of this time and are very similar to those produced in Philadelphia, Baltimore, and Alexandria. This style is commonly called Philadelphia style because Philadelphia was one of the earliest centers of urban potting in the country and it borrowed traits from English produced slipware dating to the late 17th and early 18th century. Many other urban potters either trained in Philadelphia or tried to copy the wares that were being produced there. As this style was very in vogue at the time. The two small-footed bowls are also very Philadelphia influenced. These bowls are often decorated with large petals of slip splotched with brown and green. Similarly decorated bowls have also been found in Baltimore and Alexandria (there is a very good article on the Alexandria produced slipware in the 2003 Ceramics in America journal). The chamber pot is highly unusual for the time its decoration is more similar to English produced slipware dating to around 1720 However the English wares are potted with s buff firing clay and this chamber pot is made of a typical American reddish brown firing clay. The three plates can be dated to circa 1755-1765. These combed slipware plates are decorated with very liberal amounts of cream-colored slip and splotched with green copper oxide. The slip trailing was also combed to create a more unique pattern. Having been lucky enough to have dug privies of this age in Baltimore I have many examples of likely Baltimore produced slipware. Upon comparison to the Wilmington found pieces. I found similarities in decoration and potting style along with differences. I expected this because John Brown, Baltimore’s first potter trained under Mathew Crips in Wilmington circa 1760-1762 and then after his short apprenticeship came to Baltimore in 1763 where he set up his first pottery on Bond street in fells point. Most of my Baltimore slipware was recovered a few blocks from Browns first pottery site. Similarities I found were the decoration on the bowls, pans, and plates. It looks as though both Crips and Brown preferred the use of slip cups with a single quill for decoration where as Philadelphia and Alexandria potters preferred the use of multiple quill slip cups. The feet of the bowls are much simpler on the Baltimore made Bowls where as the Wilmington ones are more elaborate and finely tooled. Though I have yet to find an instance of a Baltimore plate that exhibits combing. Also the plates made in both Wilmington and Baltimore are very thinly potted where as the Philadelphia examples tend to be fairly thick and heavy. On a recent trip to Philadelphia I brought some of my Wilmington recovered Slipware to Philadelphia’s archeology museum. There the head archeologist and myself compared the Wilmington Slipware to similar context pieces found in Philadelphia. Though the Wilmington and Philadelphia bowls were much more similar then The Baltimore ones you could still see a much more creamy appearance to the slip on the Wilmington examples. The Philly plates had much heaver coggling to the rims and combed decoration was quite rare but not completely absent. The pans were also very similar to those made in Philly though the decoration tended to be thicker bands of slip on the Philly examples. The chamber pot was very different and the archeologist said he had never seen anything quite like it in Philadelphia slipware and had nothing he could compare it to. I have however seen some slip decorated chamber pots that were made in Baltimore. However the decoration was much simpler and these pieces were quite a bit later dating to circa 1800-1830. Due to the early age of this pot and that it was found in Wilmington and the differences between it and the Baltimore and Philadelphia pieces. I believe its very likely also locally produced so a possible Mathew Crips attribution is very reasonable at this time. This type of porcelain was first being imported into Europe by the late 16th century (late Ming dynasty). The popularity of these wares steadily increased by the early 18th century these types of porcelain were being imported into the American colonies. Most of these early wares were blue and white decorated or painted in the Famille Verte color pallet which includes very vibrant greens and reds. By the second quarter of the 18th century the Famille Rose color pallet had been adopted this pallet consists of more subtle colors of pinks and purples along with other over glaze colors. This pallet and the simple blue and white remained popular through out the rest of the 18th century. This type of porcelain was found throughout both main trash layers. Of the two pieces pictured below. The plate was found in the lower of the two layers and probably dates to between 1750s-1760s. It was under glaze painted in the ever popular blue and white pallet with a small ocher accent band around the edge. Where as the bowl was recovered from the upper of the two layers dating it to the 1770s-1780s. It is over glazed enameled in the Famille Rose pallet exhibiting pink, orange and purple flowers. Was first made in by John Dwight in Fulham England during the 1680s, By about 1710 its manufacture was began by Staffordshire potters. Soon production was began they found that mixing calcined flint in roughly equal measure with white-firing clay produced a strong yet very workable clay body. This new body was very suited for block press molding of plates and saucers and for the newly invented slip casting technique used to make ornately shaped tea pots and other forms. Helping to liberate the potter from the simple potters wheel. By about 1740 molded plate rims in standardized patterns were introduced with motifs known as "dot, diaper and basket", "bead and reel", and "barley". 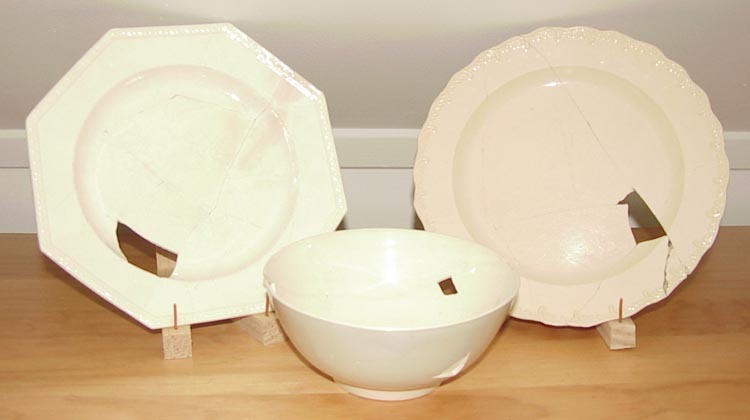 While most commonly left plain white some of these plates were sometimes painted with metal oxides in similar clouded patterns as seen on the Whieldon creamwares. The large platter pictured below is of the type that would have been made using the block press molding technique. The platters rim is in the popular “Barley” pattern. 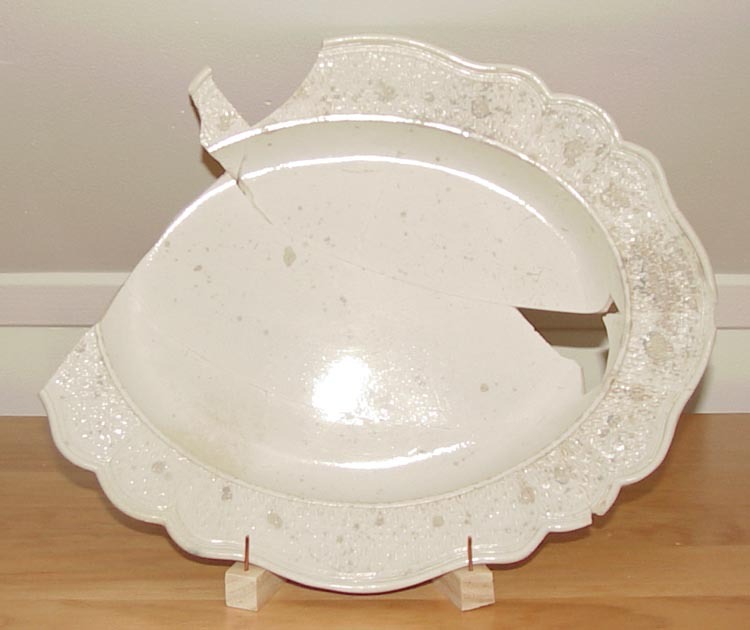 This platter was found in the lower of the two main trash layers and would date between 1750s-1760s. This type of ware was produced in both continental Europe and England from the later 16th century until the early 19th century. It is characterized by coarse earthenware paste that is thick but still light with a soft texture, and untempered with an opaque white glaze made up of a simple lead glaze with tin oxide added in a ratio of 1:3. Colors vary from buff to pale-yellow to pink on English, Dutch and Portuguese wares, while French and Italian tin-glazed ceramics may have reddish pastes. Many of the pieces produced during the mid 18th century were decorated with designs that are very similar to the popular Chinese export porcelain of the time. Though other decorations such as family crests and maritime scene be found. 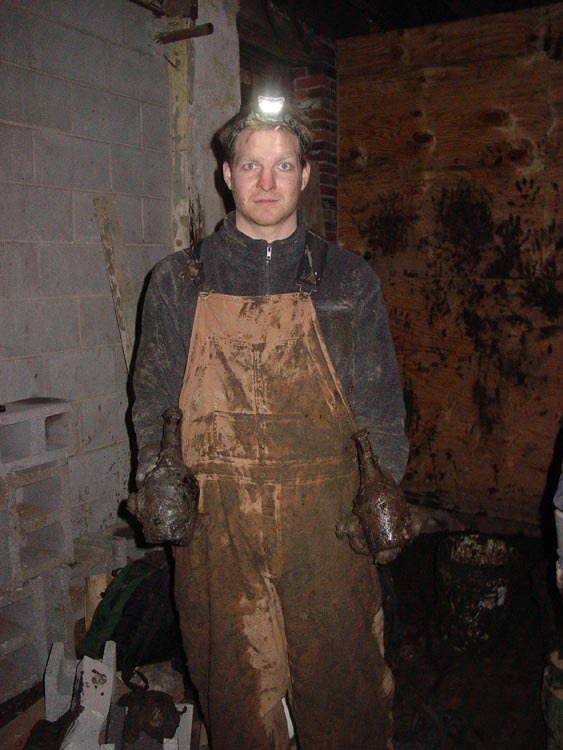 The two pieces pictured below were both found in the lower of the two main trash layers. This dates the two pieces to the 1750s-1760s both pieces are painted with Chinese Export Porcelain inspired motifs. The small plate exhibits a blue on white floral scene. Where as the bowl has a much more elaborate polychrome painted scene in green, blue, purple, yellow, and orange also mimicking Chinese wares of the period. Because this type of ware was made throughout Europe making an attribution to a particular potting center is impossible at this time. The first pearlware was credited to Josiah Wedgwood he devolved the ware over a period of several years and first marketed it in 1779. Though recent evidence points to Staffordshire potters producing a ware which they called “china glaze” several years before Wedgwood introduced his ware. It was found that simply replacing the iron oxide in the glaze used on creamware with cobalt oxide you created a glaze that fired to a pale bluish white and was much more aesthetically pleasing when painted in under glaze colors. The first Mocha was produced in the late 1770s in a creamware body however this was not very popular and was quickly replaced with the blue white firing pearlware glaze by the early 1780s. Many early examples exhibit engine or lathe turning this form of decoration is done by coating the entire piece in colored slips and turning on a lathe with gear controlled cutting knives used to scrape away the surface slip coating on the green piece. 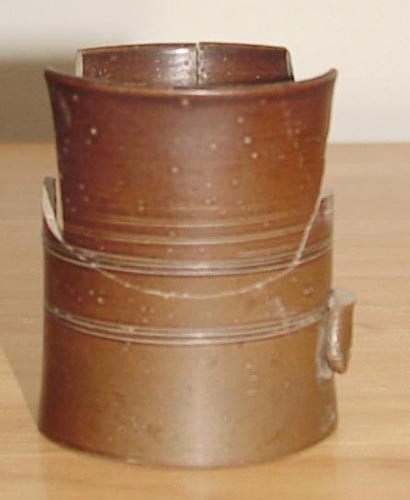 Other techniques were decorating with a slipcup to produce popular patterns such a cable (earthworm) and cats eye. Numerous other patters were also produced including Agate, Seaweed, Rings, Twigs, and Dots. The tankard pictured below is decorated in the Agate pattern and is glazed with the pearlware blue white firing glaze. This piece was found in the uppermost trash layer dating it to the 1780s. 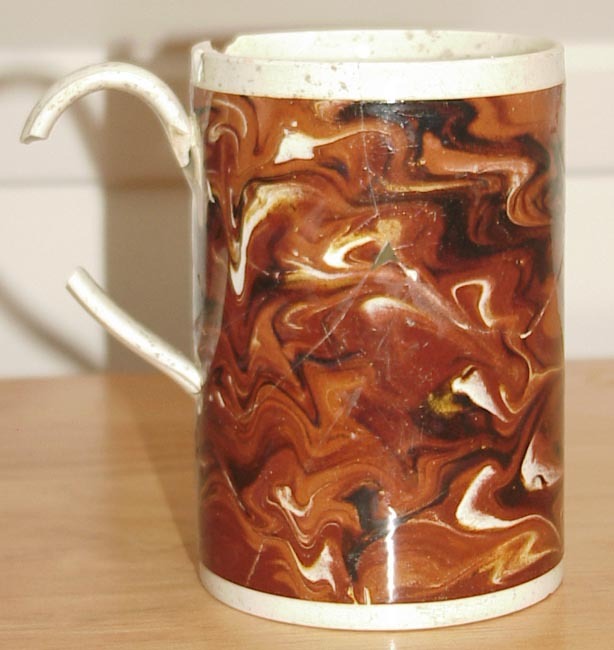 Commercial production of Agate Ware doesn’t begin until 1729 when Samuel Bell at the lower street pot works, Newcastle Under Lyme was granted a patent to produce Red marbled stoneware. Bells products were thrown on a wheel then turned on a lathe to thin the body and create a clean variegated surface capable of receiving a clear led glaze. Even though Bell’s patent states he is producing stoneware its mostlikely he was producing a type of twice fired earthenware. After lathe turning the ware was fired to a biscuit state then a liquid lead glaze was applied and fired again. Thrown Agate Wares reached their popularity in the 1750s but continued to be produced into the 1770s. 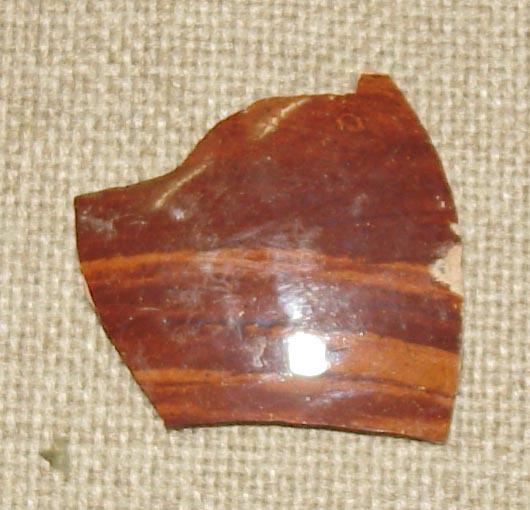 This single fragment of Agate Ware was found in the lower trash layer and dates to the 1750s-1760s.